While people can eat avocados safely, birds cannot. Avocados contain persin, a toxin that can make your bird very sick or even kill her. The Guatemalan avocado variety, which is the most common one sold in stores, is especially toxic. When it comes to avocados, keep them and recipes made from them such as guacamole away from your feathered friend. 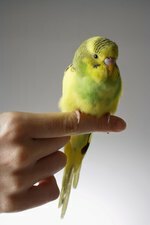 Avocados are toxic to birds, especially small ones like budgies and canaries. Avocado trees (Persea americana) and their fruit contain the chemical persin, a type of fatty acid derivative. When birds eat persin, it can cause them to become unable to perch or lead to trouble breathing, warns the Pet Poison Helpline. It also can cause fluid to accumulate around the heart and lungs, liver or kidney failure or death in some cases. The most toxic varieties of avocado are the Guatemalan and Nabal varieties, which may contain more persin than others, according to "Avian Medicine: Principles and Applications." For safety's sake, it's best to keep your feathered friend away from all varieties of avocado. Poisoning symptoms usually occur within 12 hours of a bird eating avocado; death can occur within one to two days of ingestion. There is no antidote for avocado poisoning, although an avian vet can give your bird some supportive care for her symptoms, including intravenous fluids to help dilute the avocado toxin. If you suspect your bird has eaten avocado, get her to the vet right away.